Some people are good, some bad but mankind is like a cancer! I believed that too, but fortunately, we could be wrong! 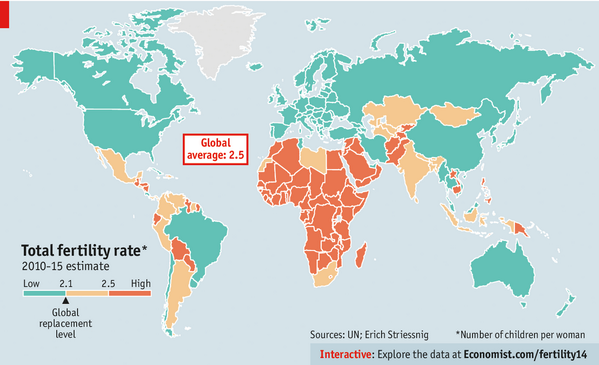 If you cross data link this stats [ http://economist.com/fertility14 ] to stats of infant mortality, life expectancy, health care and pension system, you would see there's no more growth in width instead and population growth is slowing down already. We don't see it, cause the rest growth comes from higher life expectancy in green regions. in green/turquoise regions fertility is under 2.1 children on average => population grows only there, cause people get older. With a differential equation, you would see, that population is shrinking a little bit on medium-term outlook. but it will settle again and adjust in a balance. John Maynard Keynes wrote a long time ago that in developed industrial nations growth would weaken down at some point and system gets in a state of balance after a short recession. He was completely right. Gross value added and production of goods has been growing since 2000 only slightly more. Only amount of money and debts grew on as usual because people believed in eternal growth. The figures were in front of their nose and their eyes, but the idea of infinite growth was so promising, that they were blind to reality. Then thou willt see things more clearly! Growth of future will be energy efficiency and fuel-efficient technologies. Nevertheless, I am happy because after a short hard period of recession, there will be then stability!